The BFI has recently restored and released Henri-George Clouzot’s French classic spine-chiller-thriller Les Diaboliques (1955). The restoration is a great achievement and the final result looks truly beautiful. Whilst the horror element in this classic is somewhat dated, the film still has the power to leave you with goose pimples. 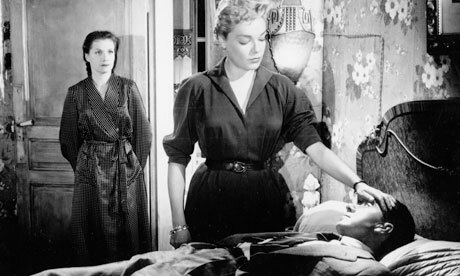 On its initial release in 1955, Les Diaboliques was a massive hit with audiences, despite some negative reviews from the more academic community of critics. It was well received by the public and, in a quirky gimmick, Clouzot asked the audience that they keep the eye-popping conclusion to themselves (shown at the end of the film), as well as insisting that all late-comers were to be turned away. The story is one of betrayal and murder, which is always a good start if you want to grab the audience’s attention, and there is clearly a Hitchcock influence (Clouzot actually took the project away from the famous director). In a private school in Northern France, a sadistic headmaster, Michel Delasalle (Paul Meurisse), rules over his wife, Christine (Véra Clouzot), and his mistress, Nicole (Simone Signoret). The two women, the most unlikely of allies, desperate to escape their tortured lives, plot to kill their mutual ‘lover’ over the school half-term. After they kill Delasalle, the mystery truly begins; they hide the body in the school swimming pool, hoping that it will be discovered and put down to a tragic accident. Eventually the pool is drained and the body is missing. What unfolds is a series of uncanny events and sightings of the Headmaster that lead to a dramatic and unexpected conclusion. Les Diaboliques’ three leading characters work incredibly well on screen and are wholly captivating, as the audience is drawn into a world of murder and uncertainty. Véra Clouzot steals the film by portraying a psychologically fragile, mousy teacher who has been subjugated to physical and mental torture for years. Meurisse is wonderful as the brutish husband, and Signoret fascinating in the role of the slighted and spiteful mistress. By setting the film in a school, there is a wonderful clash of school-boy innocence and adult sexual tension. It is also an incredibly well-balanced piece that kept me on the edge of my seat, whilst simultaneously demonstrating a macabre sense of humour. As with all good mystery-thrillers, you are guessing throughout as to the possible outcomes and Les Diaboliques keeps you gripped to the last moment. There is also a great performance of the archetypal detective, Inspector Fichet, played by the charming Charles Vanel. If you are looking for a quality mystery thriller this is the one for you. There is just very little wrong with it. Yes, the horror might be a bit dated, but the quality of Les Diaboliques’ direction, production, acting and editing is a testament to just how good film can be – sophisticated, clever and incredibly entertaining.